For a limited time only, get the Emotional Vibration Guided Meditation free when you enroll! Do you find yourself struggling to decipher your inner voice? Are you confused about what your intuition may be telling you? Are you looking for clarity and understanding from your higher self? As an intuitive, empath or highly sensitive person, your life is driven by intuition. However, when paired with your strong ability to understand and absorb emotions, you find yourself constantly questioning whether you are receiving a great intuitive insight or simply an emotional response. This program will not only show you the differences between intuitive senses and emotions, but also offer you steps to practice how to recognize these differences so you are better able to listen to your intuition and accept your ever-changing emotional states. With knowledge of how each appears, speaks, feels and pans out, overtime you can gain the ability to decipher one from the other, harnessing the positive traits of each and releasing the confusion, offering greater clarity in your life. Each email will be delivered directly to you with a lesson and action steps specifically designed to enhance your knowledge and awareness of when your intuition is speaking to you. Stop wondering whether that small voice in your head is driven by truth or emotion. You will have lessons delivered right to your inbox complete with information and action steps focused on helping you learn the difference between intuition and emotion. Enroll today and get all 7 days INSTANTLY! 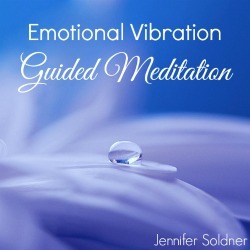 Also received this limited time BONUS – Emotional Vibration Guided Meditation (originally $9) completely free! You don’t need any previous experience to benefit from this course. It is designed to offer everyone a deeper insight into how intuition speaks to us and plays out in our lives. No more confusion. No more clouded thinking. Learn how to hear your inner voice. This is a written online program delivered straight to your inbox. Immediately after purchase you will receive a welcome email with more information about what to expect from this program followed by seven days of informative lessons and guided action steps. Not sure if a program is right for you? I encourage you to look around the website and read some articles. If you relate to the free content, then you are sure to love the programs too! An program is a written program that is delivered directly to your email inbox beginning immediately after purchase. When and how often the emails are delivered varies depending on the program, however each program delivery is spaced in a manner specifically designed to offer you optimum value for the program. Each email comes with a lesson and action steps geared toward helping you achieve a specific goal. An program is a great option for those who want daily, weekly or even monthly assistance in a specified area. Still have questions? Contact us. Please note, this is an electronic purchase and no physical product will be delivered. All program transactions are processed securely through SendOwl. Paypal, credit cards and debit cards are accepted. By purchasing this program, you agree to our specified Terms of Service. Due to the electronic nature of program material, all sales are 100% non-refundable. If you are unsure whether or not to purchase a program, I encourage you to take a look around the website and browse through the free content before making a decision. Please add ‘jennifer@jennifersoldner.com’ to your address book to prevent emails from being delivered to your spam filter. If you have not received an email within 24 hours after purchase, please contact us at info@jennifersoldner.com.